By Kathy Kuhl Last week, I posted research showing how effective homeschooling can be for students with learning challenges. You may find it helps relatives understand why you homeschool—or why you want to. But caring for and educating children is an emotional issue. Your relatives’ concerns about homeschool likely come out of a deep concern for the child and for you. Mere facts may not change their minds. On one hand, they may have legitimate concerns. Listen well. 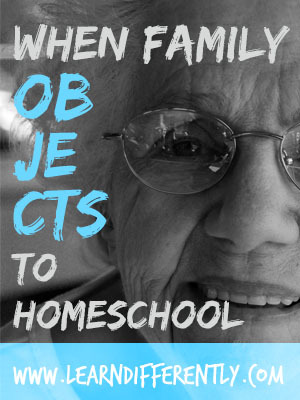 Their objections may help you homeschool better. But you may be able to address those concerns in a way that helps them go from concerned bystanders to enthusiastic supporters. When I started homeschooling, my parents were worried. My husband was supportive, but he was very concerned that my relationship with our son would suffer. First, let me be clear that I’m not a counselor. This is not legal advice. If you are in a custody dispute, I cannot help. I’m simply sharing some thoughts and resources that helped me address my family’s concerns. Sometimes your family’s worries can help you. Because of my husband’s concern that I guard my relationship with my son, I paid more attention to it. Otherwise, I might have hyperfocused on my son’s academic struggles and talents. Listening, my husband sometimes helped me improve how I talked with our son. Later, my husband became our son’s scoutmaster. Their weekend camping trips gave me time to rest and plan. Also they gave our son a break from me. Win-win! My parents were more worried than my husband was. However, when my mother attended an open house at our homeschool coop, she was impressed. It helped her to feel more comfortable with our choice to homeschool. Your relatives may also be reassured by getting to know other homeschoolers. Any dispute about homeschooling is only one part of a relationship. Ken Sande writes on building relationships and getting along with difficult situations in his blog on “relational wisdom,” RW360.org. The author of The Peacemaker, Ken gives thoughtful advice. He can help you approach your difficult situation as something more than a conflict to be resolved. Even if your family never agrees with your decision to homeschool, your willingness to listen and discuss the issues can help. They’ll see that you are being reasonable, which can reassure them. Another benefit: by talking it out calmly, you’ll also be showing your children how to disagree civilly. That’s a skill every adult needs. Being civil doesn’t mean you have to listen to nagging. When open discussion turns into constant criticism, change the subject. If relatives won’t let you do that, politely and firmly thank them for their concern and their thoughts. You may need to spend less time together, at least for a while. … In the meantime, I can guarantee if you want your son not to talk to you and you want distance from your grandchildren and daughter-in-law, keep criticizing and questioning their decision to homeschool. There is another course you could take, however. Be honest with your son and say something like, “I don’t know much about homeschooling and I worry about it, but I’ll try to learn, and I want to support your decisions.” Then ask how you can spend time with the kids, what educational resources they might enjoy as gifts, what experiences you can share through field trips and attending plays or art exhibits. Perhaps you can enjoy weekly or monthly library visits with the girls. That would make a great memory for them, and would provide a break for their mom. Expect a slow warm-up; they will be waiting for the other shoe to fall. Over time, though, you can demonstrate that your love for this young family does not amount to needing to control it. Your relatives may not know that schools have been changing rapidly since they were in school–and generally not for the better. In 2015, Nancie Atwell received the first $1 million Global Teacher Prize by the Varkey Foundation. But she cautions people now considering teaching as a career. She’s not alone. It may also surprise your relatives to learn that teachers are turning to homeschooling. For decades, caring teachers frustrated by the ineffectiveness of the school have moved to homeschooling their own kids, or to supporting homeschoolers. Many special education homeschool consultants I know used to work in public schools. Over the years, I’ve also met many homeschooling parents who had taught school. I was a schoolteacher myself. I’m sure my certifications slightly lessened my parents’ concern about my homeschooling. But here’s the secret. A teaching certificate doesn’t make you a better homeschooler. Sure, my college course on child development was helpful. (Good for any parent, aunt, or uncle.) Likewise, my educational psychology class was interesting. But the essentials could be picked up with a little independent reading. As one explained, when she taught special ed. classes, she taught in the “resource room,” a small room of kids with a range of problems. When she began to homeschool, she found she could customize instruction much more effectively than she could at work. She didn’t have to teach to the lowest common denominator. She didn’t have four students with ADHD distracting each other. It was easier for the teacher-mom and for the child. When we homeschool kids with learning challenges, customizing curriculum and methods can reduce our kid’s stress. A stressed-out kid can’t learn. Unlike in the resource room, we have much more flexibility to teach to their strengths. Though worried at first, my parents eventually supported our homeschool. They kept our kids while my husband and I got away for short trips every few years. That was golden. To this day, my mom clips articles for me on homeschooling, ADHD, autism, and learning disabilities. She always finds interesting news I’ve missed. I often pass these items on to you through my Facebook professional page, Twitter, and LinkedIn. As for my dad, soon after we started homeschooling he offered to come over once a week to be my substitute teacher. We enjoyed lunch together, then I ran errands, leaving schoolwork for them to complete. Gradually my father, a retired government executive, took over. He planned each year’s history course, each lesson, and great field trips. He even wrote and graded tests. So, use this research I shared last week as just one part of your persuasion. In modern terms, relational wisdom may be defined as your ability to discern emotions, interests and abilities in yourself and others, to interpret this information in the light of God’s Word, and to use these insights to manage your responses and relationships successfully. Nancie Atwell, after 42 years of expert teaching, won the first $1 million Global Teacher Prize, from the Varkey Foundation. Her story and a video are here. Also read her response, where Ms. Atwell clarifies her position on the teaching profession and on Common Core. She has not said, “Don’t become a teacher.” She has warned those considering the field what to look for and what to avoid.